Brexit is potentially bigger than the peace process for Ireland, Martin McGuinness has warned. The deputy first minister, a former IRA commander and central figure in negotiating landmark peace deals, said the UK decision to leave the EU is the “major crisis of our time”. “I’ve been involved in some of the most historic and important negotiations that this island has seen in 100 years, more particularly the Good Friday Agreement and the St Andrew’s Agreement,” he said. The stark outlook is not helped by a British government which is “all over the place” on the UK’s future, he added. 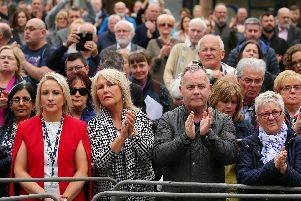 Speaking to an all-island Brexit forum in Dublin, Mr McGuinness said unionists – who have snubbed the gathering – were shocked by the outcome of the June referendum. Although Northern Ireland voted to remain in the EU, the Province’s biggest party, the DUP, had campaigned for a Leave vote. “I know for a fact that unionists were shocked by the outcome of the Brexit referendum,” Mr McGuinness said. Mr McGuinness said the British opt-out has “profound implications” for the entire island of Ireland.